We all want our tires to have a good grip on the road and last forever, but the reality is that its hard to find a tire that has both of these qualities. It seems the consensus is, that you either get one or the other. Do you want a sticky tire? Well, it will wear out quicker. Or do you want a tire that will last longer then one season? It may not be what you wanted when it comes to "performance". Keep in mind that warmer climates, road conditions and your riding style will drastically affect these factors. 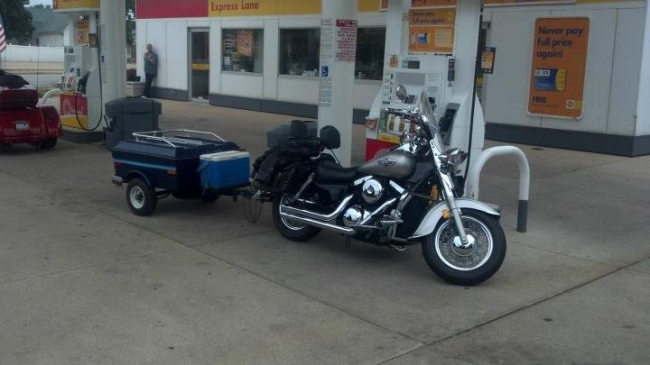 If you ride with your wife or girlfriend on the back, and both of you weigh 200 lbs. and ride very aggressive, it's not the same as a skinny dude riding like a grandma. In both instances, you will get completely different results on the same set of tires. We hope our website will help you to choose your next set of tires that suites your requirements. With so many choices of different brands of tires, it could be quite a task. If you have tried different motorcycle tires in the past, we would appreciate it, if you could take a few minutes to share your opinions and experiences with the motorcycle tires you have used. Share your pictures! You can have your motorcycle on this page! Send us a great picture of your motorcycle or tires, to be displayed here on this front page, instead of the picture that's here. Just the picture, type of bike or a short description, and the state you live. Easy! I'm riding a 500 aprilia atlantic (2003) the bike has 6500 miles on it and I'm on my 2nd set of tires. 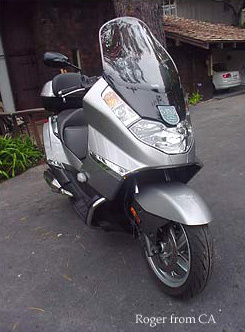 In front I run 120-70 15 maxxes and in rear 140-60-14 michilins the motorcycle is used primarily for errands and shopping. my profession is interior designer in Carmel California. We're always here to listen to your opinions, and we welcome any feedback. We want to bring you the quality information that you're looking for. You can let us know if you found this website useful, and ways that we could improve it. We are always happy to hear from you, feel free to contact us at any time. Thank you for your valuable input we do appreciate it.